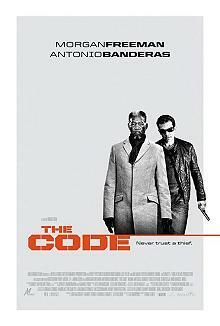 In a dashing robbery on a fast subway train, Gabriel (Banderas) steals from two Romanoff Jewellers couriers. Watching him in an older, well-dressed man (Morgan Freeman), a famous jewel thief named Ripley looking for a new partner to join him in the rarified Thieves World where debts are claimed from partners and children. Despite the apparent impossibility of breaking into the vault of Romanoffs, and the apparent disapproval of the beautiful daughter (Radha Mitchell) of Ripley's ex-partner, Gabriel is drawn into Ripley's and Alexandra's world in Little Russia. In the classic caper tradition the forces of law and out-law press the protagonist into committing the theft. This story relies more on the human (and organisational) interactions than convoluted and high-tech action. Gadgets are tools, not stars. Will the daring duo successfully steal the missing Faberge eggs? Will there be the inevitable cross-and-double-cross? What are the real motivations of the characters? Will there be a bad-guys-in-jail or a bad-guys-in-first-class ending? 92 minutes will tell.